Unrelenting data growth has spawned new scalable storage designs. We’ve all read the storage reports about overwhelming data growth. It’s certainly a big and growing challenge that deserves attention, but I’ll skip the part where I scare you into thinking we’re about to be overwhelmed under a deluge of data. We tend to store about as much data as we can, no matter how much data there might be. There has always been more data than we could keep. That’s why even the earliest data center storage systems implemented quotas, archives and data summarization. The new challenge today is effectively mining business value out of the huge amount of newly useful data, with even more coming fast in all areas of IT storage: block, file, object, and big data. If you want to stay competitive, you’ll likely have to tackle some data storage scaling projects soon. 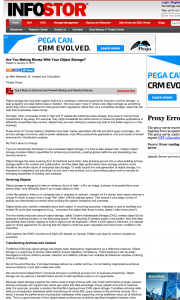 Newer approaches to large-scale storage can help. The first thing to consider is the difference between scale-up and scale-out approaches. Traditional storage systems are based on the scale-up principle, in which you incrementally grow storage capacity by simply adding more disks under a relatively fixed number of storage controllers (or small cluster of storage controllers, with one to four high availability pairs being common). If you exceed the system capacity (or performance drops off), you add another system alongside it. Scale-up storage approaches are still relevant, especially in flash-first and high-end hybrid platforms, where latency and IOPS performance are important. A large amount of dense flash can serve millions of IOPS from a small footprint. Still, larger capacity scale-up deployments can create difficult challenges — rolling out multiple scale-up systems tends to fragment the storage space, creates a management burden and requires uneven CapEx investment. 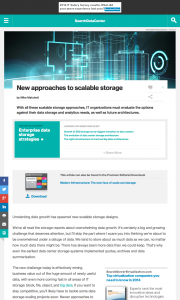 In response, many scalable storage designs have taken a scale-out approach. In scale-out designs, capacity and performance throughput grow incrementally by adding more storage nodes to a networked system cluster. Scale-up designs are often interpreted as having limited vertical growth, whereas scale-out designs imply a relatively unconstrained horizontal growth. Each node can usually service client I/O requests, and depending on how data is spread and replicated internally, each node may access any data in the cluster. As a single cluster can grow to very large scale, system management remains unified (as does the namespace in most cases). This gives scale-out designs a smoother CapEx growth path and a more overall linear performance curve. Some IT folks are trying to leverage commodity servers and disks with software-implemented storage services. But others want an all-flash architecture. 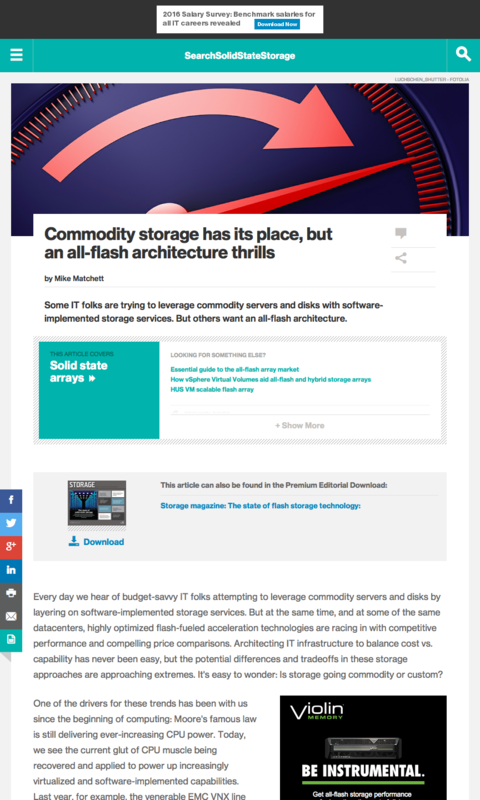 Every day we hear of budget-savvy IT folks attempting to leverage commodity servers and disks by layering on software-implemented storage services. But at the same time, and at some of the same datacenters, highly optimized flash-fueled acceleration technologies are racing in with competitive performance and compelling price comparisons. Architecting IT infrastructure to balance cost vs. capability has never been easy, but the potential differences and tradeoffs in these storage approaches are approaching extremes. 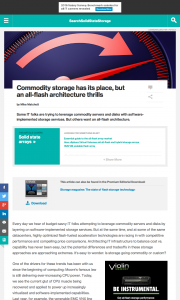 It’s easy to wonder: Is storage going commodity or custom? One of the drivers for these trends has been with us since the beginning of computing: Moore’s famous law is still delivering ever-increasing CPU power. Today, we see the current glut of CPU muscle being recovered and applied to power up increasingly virtualized and software-implemented capabilities. Last year, for example, the venerable EMC VNX line touted a multi-year effort toward making its controllers operate “multi-core,” which is to say they’re now able to take advantage of plentiful CPU power with new software-based features. This trend also shows up in the current vendor race to roll out deduplication. Even if software-based dedupe requires significant processing, cheap extra compute is enabling wider adoption. In cloud and object storage, economics trump absolute performance with capacity-oriented and software-implemented architectures popping up everywhere. Still, competitive latency matters for many workloads. When performance is one of the top requirements, optimized solutions that leverage specialized firmware and hardware have an engineered advantage. Normally, when companies invest in high-end IT assets like enterprise-class storage, they hope to recoup those investments in big ways. For example, they might accelerate the performance of market competitive applications or efficiently consolidate data centers. Maybe they are even starting to analyze big data to find better ways to run the business. These kinds of “money-making” initiatives have been mainly associated with file and block types of storage—the primary storage commonly used to power databases, host office productivity applications, and build pools of shared resources for virtualization projects. If you’ve intentionally dismissed or just overlooked object storage, it is time to take deeper look. Today’s object storage provides brilliant capabilities for enhancing productivity, creating global platforms and developing new revenue streams. Object storage is certainly a hot topic, and it’s rising above it’s old data retention “jail” perception. And for good reasons. We think due to cloud storage building and adoption, increasingly mobile users and distributed apps, the benefits of active archiving and retaining ever bigger data sets that having a solid object storage strategy becomes significantly important going into 2013. EMC is aiming to be a key part of that object strategy – today releasing Atmos 2.1 making wider adoption not only possible, but more profitable for both in-house cloud builders and service providers. There are some performance improvements under the hood (for larger file read/write), and significant increases in manageability intended to support ever larger deployments. But we think the cloud accelerators that enable better integration to organizational needs are going to provide the biggest bang. This latest version comes with expanded browser integration, an enhanced GeoDrive, more developer tools, and even some support for transitioning traditional apps to the cloud (bulk ingest, CAS metadata). The theme is definitely to broaden the integration and hasten the adoption of cloud storage, gaining both cloud economics and enhanced productivity. Atmos is already a great cloud object storage solution for web developers, but now also provides an API for Android, fast taking over the mobile marketplace. For developers in general, Atmos 2.1 can now provide anonymous URLs, which means those developers can easily build one time upload/download features into their apps (this is key for many collaboration use cases – picture or image uploads, external file sharing, content distribution and other schemes). Atmos 2.1 also supports “named objects”, which may ease certain kinds of distributed development challenges. GeoDrive, a free addon to licensed Atmos customers, provides a secure, cached, drag and drop cloud drive interface. GeoDrive really makes collaboration easy by eliminating the need to set up complicated shares or mount points. Now with GeoDrive 1.1, there are a bunch of enhancements including built-in data encryption and a CIFS Cloud Gateway so you don’t always need client side software. Shareable URL’s bring more collaboration into the picture to improve the private “dropbox” use case. And collaboration is truly going global with GeoDrive now available in 10 languages (Atmos itself is already highly suited for distributed global cloud storage). Perhaps most important is the new Native (Amazon) S3 API support. By enabling customers to migrate S3 apps to Atmos (and vice-versa), Atmos cloud providers can now offer hybrid and mixed solutions alternatives, without threatening vendor lock-in. Enterprises holding back because of fears of vendor lock-in (or that were tied into S3) can now consider the various SLA’s, services, and price options presented by Atmos powered options.